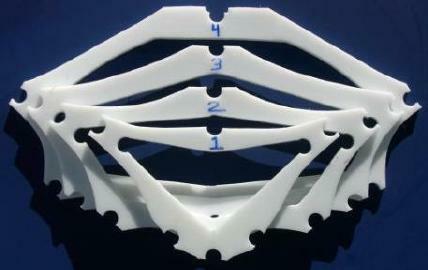 High Density Polyethylene (HDPE) is used to make the cross sections. 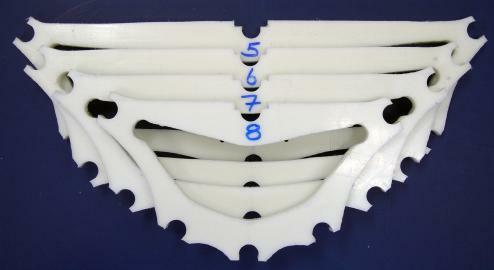 This material is easy to cut and drill and is very durable. It’s main feature is it’s ability to “snap” onto the aluminum stingers for assembly. This eliminates the need for making complicated mechanical connectors. HDPE cross sections have been used by commercial manufacturer “Feathercraft” for many years.HDPE comes in 4ft by 8ft sheets and costs approx. $150.00US per sheet. That’s enough material to make cross sections and coamings for 2+ kayaks depending on the size and the number of cross sections. HDPE can be drilled with standard wood bits, and cut with smooth wood cutting jigsaw blades. There is no sanding or finishing required. A file is used on the edges to smooth them after cutting. 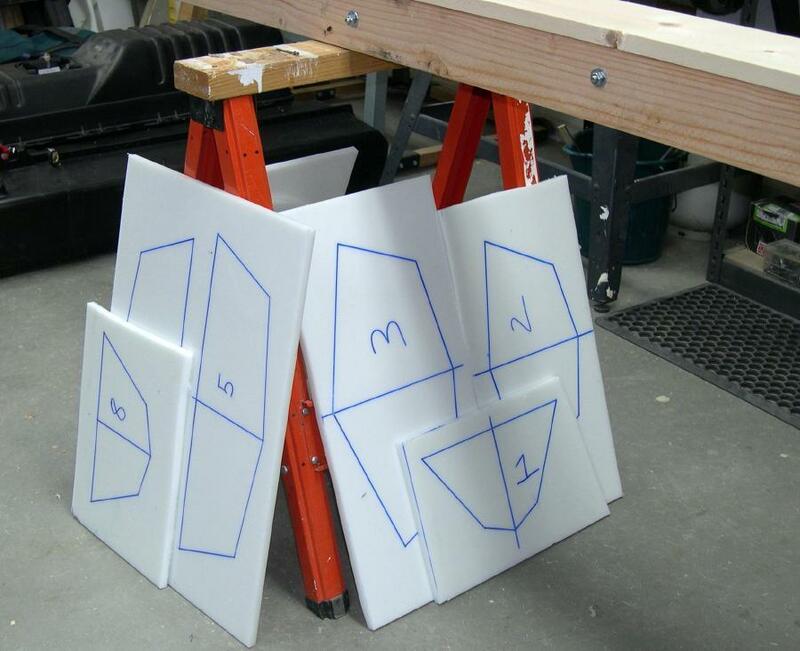 Though heavier than plywood, the total weight of the 8 Sea Ranger cross sections is under 4 lbs. Drill Press – Since the holes need to be precision cut, a drill press is recommended. A 3/4″ Forstner bit is used. Jig Saw – A standard jigsaw with smooth cutting “wood” blades are used to cut out the sections. Blades and bits last a long time when used for cutting and drilling HDPE. 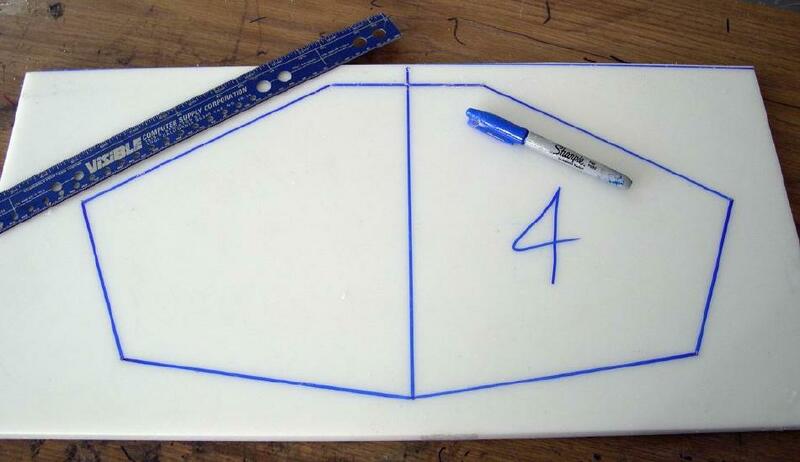 Marking Offset points on HDPE – Tape the template to a section of 1/2″ HDPE. 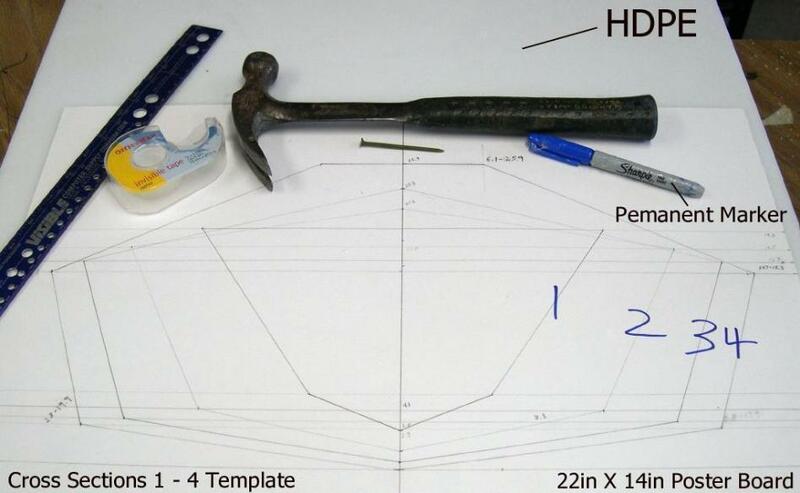 Using a hammer and nail, mark the keel, chine, gunwale, and deckridge offset points for one of the cross sections. Remove the template to expose the marks in the HDPE. Use a permanent marker to highlight the nail holes in the HDPE. Creating a temporary outline – With the nail marks as a guide, use a ruler and permanent marker to define the “temporary” outline of the cross sections. The final cross section shape between offset points will be concave, with the straight lines between points serving as a reference. Permanent Marker Pen – The “Sharpie” permanent marker ink is not permanent on HDPE. It can be removed with a cloth. A standard marker pen will not work on HDPE due to the slick surface. Repeat the procedures described in this section to complete all eight cross sections. Next, draw reference lines for drilling the stringer to cross section “snap” connection holes.